Handbag is one of the most important accessories of women's wardrobe. And if your favorite bags worn out handles and they were ugly scuffs, do not hurry to throw away a favorite thing. Handles you can easily update and return the bag an attractive appearance. The easiest way to update not only worn handles, but the General appearance of the bags is either a disguise or a complete replacement of degraded elements. If the bag is made of genuine or faux leather, to mask small abrasions will help preparation for professional leather repair products liquid leather" sold in major Shoe stores. "Liquid skin" removes scuffs, scratches and small cuts, but when you buy tools, it is important to choose a shade that matches the colour of the bag. If scuffs and cracks on the handles of bags, it is advisable to replace such pens. Alternatively can be used the same belts or chains ready to be sold in the hardware departments. Belts should match the style and color of the bag. To use the straps as handles, it is necessary to adjust their length to the desired size and pin to the bag either by means of rivets, which are installed in workshops of metal pieces, either using the rings, if the bag they are used. For mounting on the rings of the lower edge of the belt is a little bent and zastrugivajut for the formation of a small loop. Bag ring unbend with a pair of pliers, put it in the loop of the belt and reconnect. 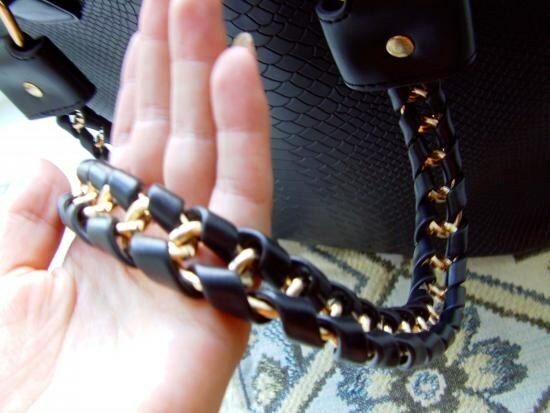 To replace worn handles on a nice chain, you must find a chain that matched the style and color of the bag. Handles can be done from the single-circuit and double-folded. With the help of pliers the lower links of the chain are disconnected and fixed to the rings or loops for pens. Looks very original ribbon or leather cord, passed through the links throughout the chain bag is not only new grips but also a completely different look. If you are trimming the skin, suitable color to the bag, one can carve out a new handle. To do this the old grips off, gently pull and fix on a piece of cardboard with staples or rubber cement. Encircled and cut along the contour of the part will serve as a template for cutting the new handles. From patchwork leather cut out new parts, in the center of the handles is attached a nylon braid or narrow grosgrain ribbon, protecting the skin from deformation in the process of operation. Every detail of the coat with a rubber adhesive, fold in half, and after drying, the adhesive prostrachivajut straight seam, trying to lay a smooth line on the edge of the handle. If the sewing machine sews the bad skin, the details of the handle you can lightly grease baby cream – this measure facilitates the work of the mechanism of the typewriter and the sewing needle. To give rigidity in prepared items inserting a thick twisted cord or filler of old, ripped handles. The edge of the workpiece inserted into the ring in bags, folded and double-stitched on the machine.